&amp;amp;lt;img src=”http://www.irishnews.com/picturesarchive/irishnews/irishnews/2015/09/04/164903294-9d71179d-2aea-41ce-a492-039ca737ccd1.jpg&#8221; alt=”PART TWO: Northern Ireland’s £1bn debt collectors” title=”PART TWO: Northern Ireland’s £1bn debt collectors” class=”img-responsive” /&amp;amp;gt;Last year, a new and extremely powerful landlord – of sorts – appeared on the scene in Northern Ireland. Enter Cerberus Capital Management. In April last year Northern Ireland’s biggest ever property deal was secured when Cerberus bought from Nama a loan book portfolio concerning 850 properties for a knockdown £1.3 billion. It is a deal that has been shrouded in controversy. In the second of a two part series Susan Thompson takes a look at how property developers have fared since the US investment company moved into Belfast. Last year, a new and extremely powerful landlord – of sorts – appeared on the scene in Northern Ireland. A landlord that controlled the loans on 850 properties and one that wanted its money back fast and with interest on top. Enter Cerberus Capital Management. Many Cerberus debtors were asked to draw up business plans and submit them to Capita, Cerberus’s loan administrators. In nearly all cases, The Irish News understands, they were rejected. Some debtors were not asked to submit plans. Regardless if you were asked or not, debtors typically found themselves in front of Cerberus’s no-nonsense Belfast-based debt collectors. The wait, often in Capita’s offices in the Metro building in Donegall Square, where Cerberus held most of its meetings, was typically an anxious one. One debtor said the rough rule of thumb was repayment in full plus 20 per cent in three months. If you wanted longer then it was more than 20 per cent. Although there has been plenty of unease about the treatment of debtors by Cerberus since it entered Northern Ireland, most of the bigger property groups have successfully negotiated exits. Many have done this through finding new lenders. Their new partners often invest in the company rather than simply demand payback. Gerard O’Hare’s Parker Green International, which owns the Quays shopping centre in Newry, found backing from the Garrison Investment Group in New York and Earlsfort Capital in Dublin. He has described Cerberus as pragmatic and practical compared to Nama. Others that have found new backers include Lagan Development (Holdings), which is jointly owned by brothers Kevin and Michael Lagan, Noel Murphy’s MAR Properties and Paddy Kearney’s Kilmona Holdings. The Irish News also understands that Frank Boyd’s Killultagh Estates is close to reaching an agreement with Cerberus. Other borrowers, in a fortunate enough position to do so, have paid Cerberus back, plus interest, through personal means. But these are the good news stories. There is chatter of the Cerberus deal working well for the top developers and less well for the smaller property owners. Belfast businessman Gareth Graham is fighting a High Court battle in an attempt to win back control of his property companies. Yesterday he told the Stormont finance committee that Cerberus had been “ruthless, unjust and unreasonable” in demanding repayments of £33 million within 24 hours following a series of brief meetings. After forwarding a series of proposals to Cerberus, the company told Mr Graham they were not acceptable. He says further efforts to negotiate with the company proved fruitless. Mr Graham insists he never missed a repayment. Downpatrick-based developer John Miskelly’s Ten Square hotel was also put into administration after talks soured. One businessman told The Irish News that there has been plenty of debate about the potential existence of an informal agreement between the government and Cerberus. The Cerberus deal has, of course, become the centre of what is alleged to be a high profile financial and political scandal. The National Crime agency is investigating a £7 million payment made to Belfast law firm Tughans for work it carried out for Cerberus via the Dublin office of US law firm Brown Rudnick. Ian Coulter, the former Tughans managing partner, said that the concept of a Nama deal was developed by “other business people” in Northern Ireland before any involvement of Cerberus or any bidder. The Irish News understands these “other business people” include a partner at a top Belfast-based accountancy firm and a leading property developer. What was agreed between Stormont and Cerberus? The British government has said it found it “strange” that no Memorandum of Understanding (MoU), which would have set in stone the terms that Cerberus could operate in Northern Ireland, was agreed with the NI Executive. And it is strange given that just three months before the Cerberus deal was announced, the First Minister’s office sent what appeared to be a proposal for a memorandum of understanding with Pimco to Nama. Frank Daly, chairman of Nama, has described the memo as a “debtors charter,” giving existing debtors significant rights and protections on a sale. Pimco had made an unsolicited bid for the Nama NI portfolio to Stormont. In papers released last night by Nama – in response to questions posed by Nama’s Finance Committee – Simon Hamilton, Finance Minister, suggested to Mr Daly that a sale to Pimco, without opening the process up to any other party, would avoid any potential panic in the market. The pursuit of personal guarantees – documents signed by property developers making them personally liable for the debts of their companies – by Nama had been raised as a huge concern at the highest political levels in Northern Ireland. Pimco, however, withdrew from the race for Nama’s assets after it transpired that it had agreed to pay a £5 million fee to Northern Irish businessman Frank Cushnahan, a former Nama Northern Ireland committee member. It begs the question, if an agreement had been seemingly made between the First Minister and Pimco, why did the successful bidder Cerberus not have to sign up to a similar agreement? Or did it? What comfort on the treatment of debtors was received by Stormont from Cerberus, official or unofficial? We simply do not know because the First Minister has declined to comment. He has also refused to disclose if anything was agreed at a secret meeting he had with the former US vice-president and Cerberus deal maker Dan Quayle, alongside Coulter, the former Tughans lawyer and finance minister Simon Hamilton. 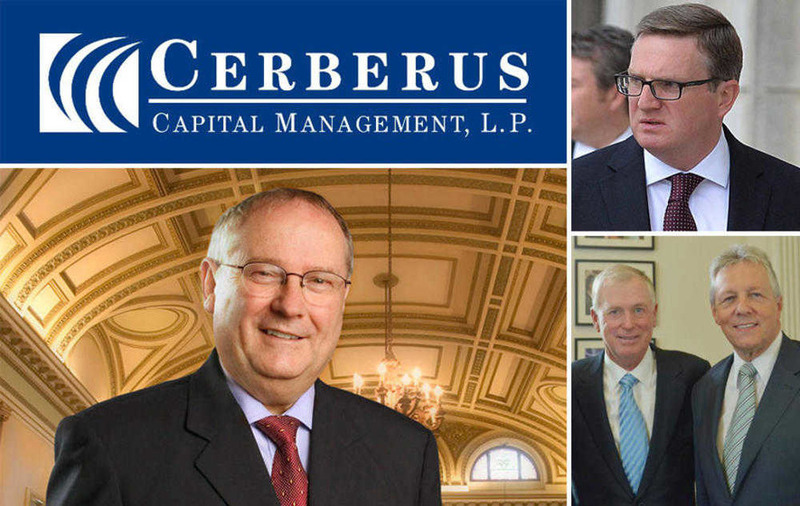 The meeting at Stormont Castle was held just 10 days before Cerberus announced in April it had secured the Nama assets. But back to the memorandum of understanding that Cerberus didn’t seemingly sign. The first item on the memo was the release of “all corporate guarantees and personal guarantees… for nil payment”. Cerberus has enforced one personal guarantee with a value of £200,000. Yet despite all the political sensitivity the personal guarantees have endured, they can still be used as leverage by Cerberus. The memorandum of understanding also stipulated that “the buyer” must commit to investing, where viable. Examples of such investment by Cerberus are hard to find. What is apparent is that, under Cerberus’ new ownership, the debtors of the loan book have not enjoyed the protection the suggested memorandum of understanding sought to give them.